This post is in partnership with Daiya Foods. Thanks for supporting the brands that help make Bubby and Bean possible. 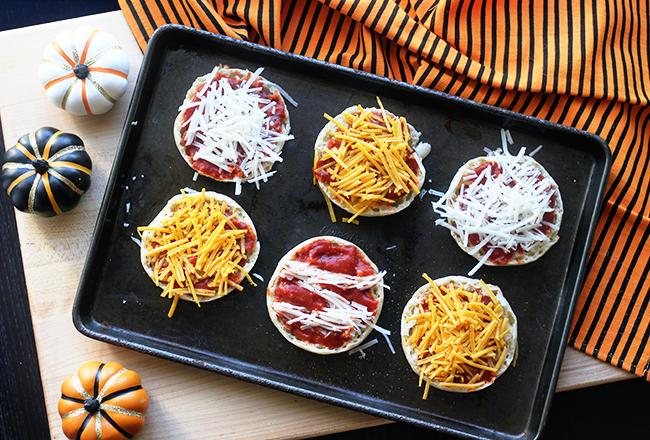 There are so many reasons to love October: apple picking, sweater weather, Halloween, pizza... Yes, pizza! Until recently I didn't associate pizza with October, but when I found out that it's National Pizza Month, I immediately got to celebrating. I mean, I love pizza year round, but this has given me the perfect excuse to eat it more often. I've been a vegetarian since high school, so cheese or cheese and veggie pizza has always been my go-to. But I've been working to make healthy choices in my eating habits over the past couple of years by incorporating more plant-based alternatives into my food choices - including pizza. This admittedly created a slight predicament for me for a while, because cheese was always what made pizza for me. I actually tried making it a few times with just sauce and veggies, but I wasn't a fan. Then last year, I discovered Daiya's Cutting Board Collection of Shreds which I used to make plant-based nachos, and soon after started making my own pizzas with them too. And you guys, they are so good. 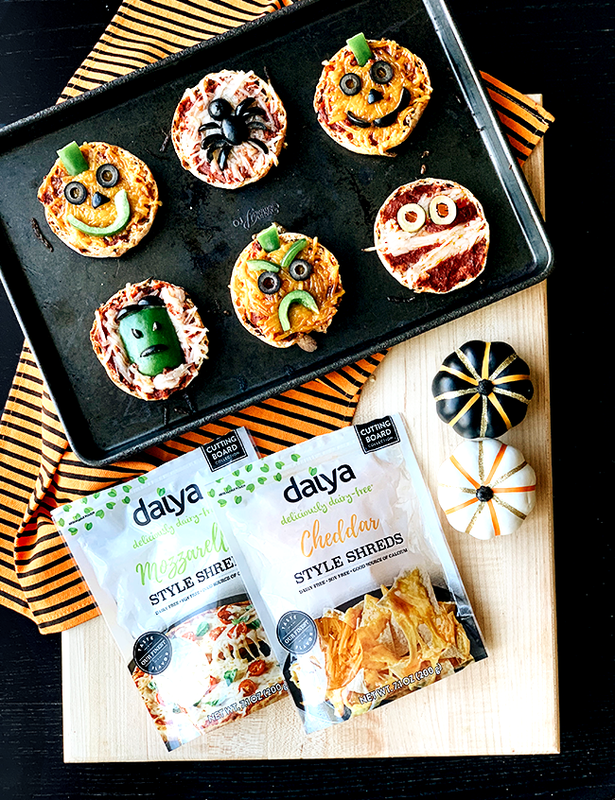 I've experimented with all sorts of plant-based pizzas using Daiya's Shreds - from made-from-scratch dough pizzas with fancy ingredients to the super easy, super fun Halloween-themed mini pizzas I'm sharing today. 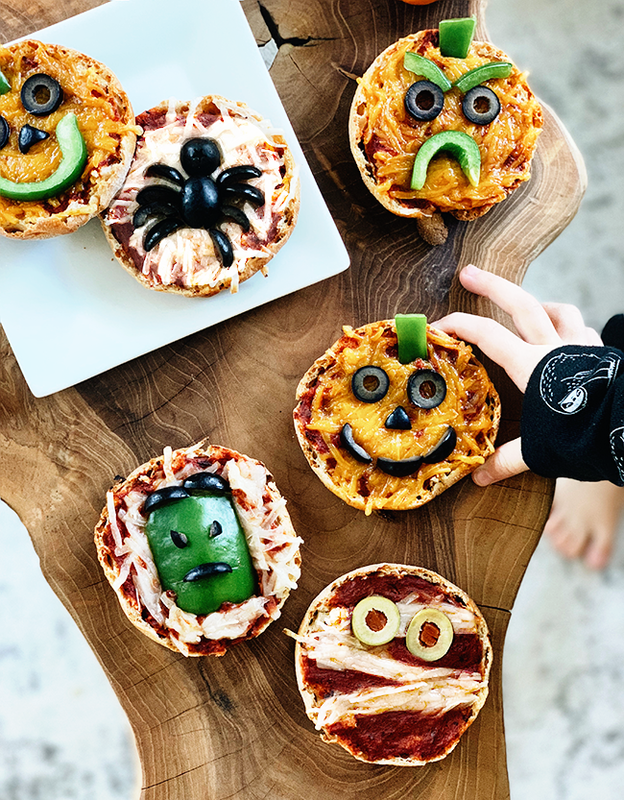 They're made with vegan english muffins and topped with Daiya's Cutting Board Collection Shreds and are perfect for Halloween parties, snacks, or meals. They're also something the kids can easily help make. I think you will love them as much as we do! *Many english muffins are vegan and some are also gluten free; check ingredients. Preheat oven to 375 degrees. Placed halved english muffins cut side up on a baking sheet, and top each with pizza sauce until covered. Top half of the pizzas with Daiya Cutting Board Collection Cheddar Style Shreds, and the other half with Daiya Cutting Board Collection Mozzarella Style Shreds. (If you want to make a mummy pizza, use the Mozzarella Style Shreds to form "bandages".) Bake for about 10 minutes, or until Shreds are full melted. Then get creative! 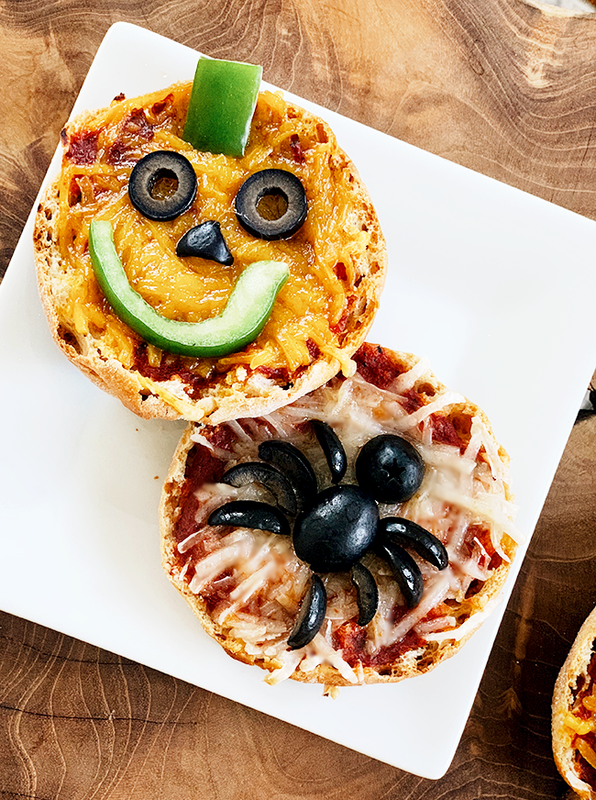 To make a jack-o-lantern, create a face with black olives and sliced green pepper, and a pumpkin stem from green pepper. 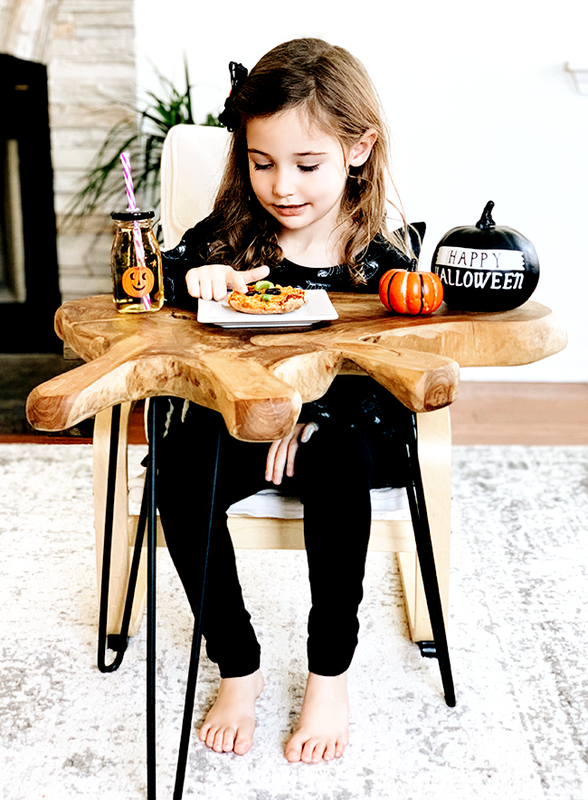 To make a spider pizza, top with a vertically halved black olive for the body, a horizontally halved black olive for the head, and sliced black olives for the legs. 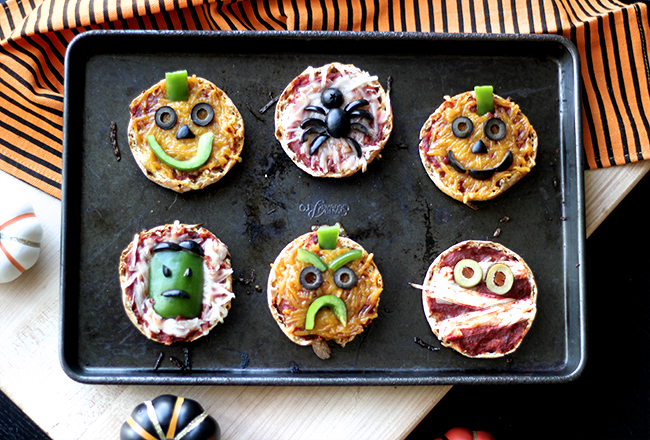 To make a mummy pizza, use green olives to create eyes. To make a monster/Frankenstein pizza, top with a piece of sliced green pepper and small olive pieces. My kids have been asking to make these almost everyday, and I don't blame them. They're so much fun, and they're also easy and super delicious. And you'd never guess that they're plant-based and not made with dairy cheese. The key ingredient, of course, is Daiya's delicious Cutting Board Collection Shreds. You've heard me profess my love for many of Daiya's plant-based comfort foods in the past, so it's probably no secret why I love these pizzas so much. The Cutting Board Collection Shreds stretch and melt just like regular ol' dairy-based cheese, but (just like Daiya's other foods), they're free of top food allergens like dairy, gluten, nuts and soy. And the line is available in Cheddar Style, Mozzarella Style and Pepperjack Style, so there's something for everyone and for every kind of cheese-based recipe. 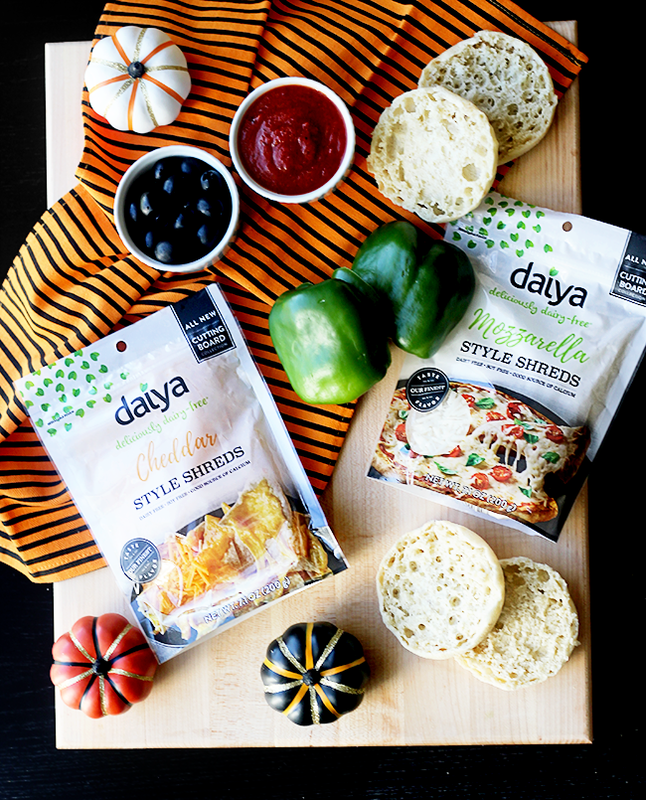 If you haven't tried Daiya yet, head on over to your local grocery store. Their products can be found in more than 25,000 of them in U.S., from Whole Foods, Kroger, Safeway, Publix, and Meijer to natural food retailers. If you try these yummy plant-based mini pizzas, let me know what you think. 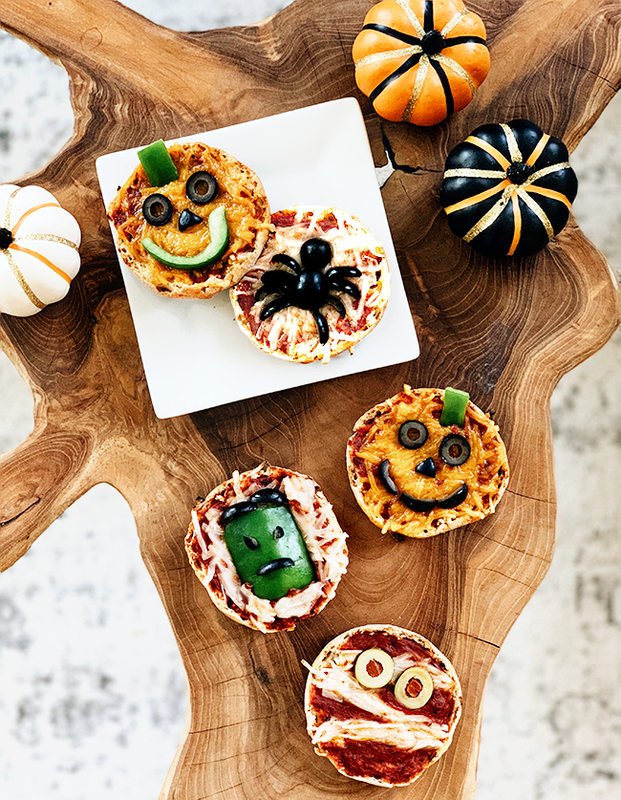 Happy National Pizza Month and Happy Halloween! These are amazing! Totally making them! So fun. Genius! I love that they're vegan. These are cute and I bet they are tasty too!